Caitlin McGee-Crane - Co-founder, CEO/Executive Director, Networking, In Person Communication, Volunteer Coordinator - Caitlin graduated from Arcadia University in 2010 with a degree in International Studies and a minor in Spanish. She received her Masters at American University in International Training and Education in 2012. In addition, Caitlin has a certificate in Non-Profit Management. Caitlin spent a semester studying abroad in Equatorial Guinea and volunteering in a local primary school. Amanda Malamut – Co-founder, COO/Executive Director, Technology, Accounting – Amanda graduated from Arcadia University in 2010 with a degree in International Studies and a minor in Spanish. She earned her Masters at American University in International Training and Education in 2012. Amanda spent a semester studying abroad in Equatorial Guinea and volunteering in a local primary school. Ann Elizabeth (Nancy) McGee - General Director, Shipping Coordinator, Volunteer Support - Nancy McGee graduated from Kutztown University with a degree in Psychology, focusing on Social Work, and a minor in Spanish. She has served as a member on several non-profit boards, and has been in charge of many recurring fund raising efforts. 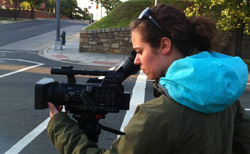 Angela Massino - Videographer/Social Media Guru- Angela Massino is currently the Multi-Media and Communications Associate at DC Alliance of Youth Advocates in Washington, DC. Along with managing the organizations online platforms, Angela creates short videos about DC youth re-engaging with their communities through local youth development programs. Upon graduating from Lynchburg College with a degree in Electronic Media, Angela worked on a documentary project with DC Lawyers for Youth about the intricacies of the DC juvenile justice system. Katie Arias, our "translator extraordinaire", graduated from Arcadia University in 2010 with a major in International Studies and Minor in Spanish. She has worked for a few non profit organizations in administrative and fundraising roles. Katie is our "go-to girl" for our everyday translating needs, from documents to whole videos. Estefanía Berretta- Certified Legal Translator- Estefanía graduated from Universidad Católica Argentina (UCA) in 2010 with a degree in Translation. She is currently studying to become a lawyer in her country. In addition, Estefanía is currently working as an English-Spanish translator at Transquality and a professor at Asociación Internacional de Estudios- Registered Centre University of London in Buenos Aires. Estefanía spent a semester studying abroad at Washington College where she took courses on world politics, sociology and business. Estefania will be translating letters for our "Dear Friend" program. Baltasar Ngumu Ngumu Eyang is our Volunteer Coordinator in Equatorial Guinea as well as another translator for our Dear Friend Program. He says "I'm a citizen of Equatorial Guinea, specifically from Ebibeyin Kie-Ntem on the main land. I still consider myself as a student for I still have (long term) plans of finishing my HR and engineering degrees. I am currently working full time (8:00 Am to 5:00 PM - Monday to Friday) with Marathon Equatorial Guinea Production Limited, MEGPL. Previous to my current job, I have worked as a Logistic Coordinator with the Bioko Island Malaria Control Project, BIMCP led by Medical Care Development International, MCDI. Informally I have worked as an English Professor at the ORIS English Language Institute, and as a Taxi Driver. Regarding my education background, I have one year of Petroleum technology from our local University of Equatorial Guinea, UNGE. Besides that, I have an unfinished Human Resources Development degree from Texas A&M University- Junior Level. I am excited about this ONG because they help and support the education of our children. Because I have a strong conviction that Education is the key of Development, Change and Success, supporting education, volunteering or working for you in the little time I have available will mean a lot to me." Ana Maria Garcia – Board Member – Assistant Professor and Chair of Sociology, Arcadia University - Dr. García received her B.A. from Drew University in New Jersey and her doctorate in clinical psychology from Hahnemann University. Prior to joining Arcadia she served as Senior Staff Psychologist and Director of Training at the Child Psychiatry Center in Philadelphia, and as Senior Consultant, Project Coordinator, and Director of Client Services for Eclipse Consultant Group, an organization that developed and conducted diversity training in higher education, business, healthcare, and school settings. Dr. García's professional presentations and publications focus on diversity issues, including issues of race, ethnicity, gender and sexual orientation. Jennifer Riggan – Board Member - Dr. Riggan began teaching at Arcadia in 2007. She earned a Ph.D. from the Education, Culture and Society program at the University of Pennsylvania, where she received training in political and educational anthropology and African Studies. Her research on the role of teachers in state-making in the east African nation of Eritrea was funded by a Fulbright grant and a Social Science Research Council Fellowship. Dr. Riggan has lived and worked in East Africa and traveled in Europe and Latin America. Her research addresses a variety of issues including nationalism, citizenship, the ethnography of the state, the anthropology of war and conflict, critical development studies, international education and globalization. She teaches courses on African Cultural History, Global Poverty and Inequality, The Social Life or War, and Global Citizenship. She earned a B.A. in English from Trinity College in 1992 and served as a Peace Corps volunteer in Eritrea from 1995 to 1997. Mary Johnson – Board Member – Studied at University of Oklahoma. Mary Johnson lived in Equatorial Guinea and had extended contact within the community for several years and volunteered in a local orphanage. Nikunj Shah - Board Member - Nikunj graduated from Arcadia University with a degree in Computer Science focusing on how technology can be a cornerstone of an effective non-profit (through Arcadia's Community Service office). He is currently earning an MBA with a concentration in New Ventures and Entrepreneurial Studies from Penn State Great Valley. His main passions lie in charities that support community development and education, having participated in several community service building trips, organized Habitat for Humanity builds, and incorporated teaching and training into his everyday work. He also continues to support educational endeavors by serving on board of trustees of Arcadia University.